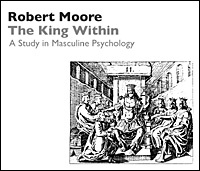 One of the four archetypes of the mature male psyche described by Robert Moore—King, Warrior, Magician and Lover—the King is the central archetype in the masculine psyche. Without dis-identification from this archetype—and without a dynamic connection to it—a man will be immobilized by grandiosity, lost in depression, and bereft of a sense of meaning, just order, and connection with the creative springs of the psyche. The mature King is able to empower others as well as himself.